Last year on August 29, a prominent gastroenterologist Dr Deepak Amrapurkar died after falling into an open manhole near Elphinstone while walking along a flooded street during torrential rain in Mumbai. 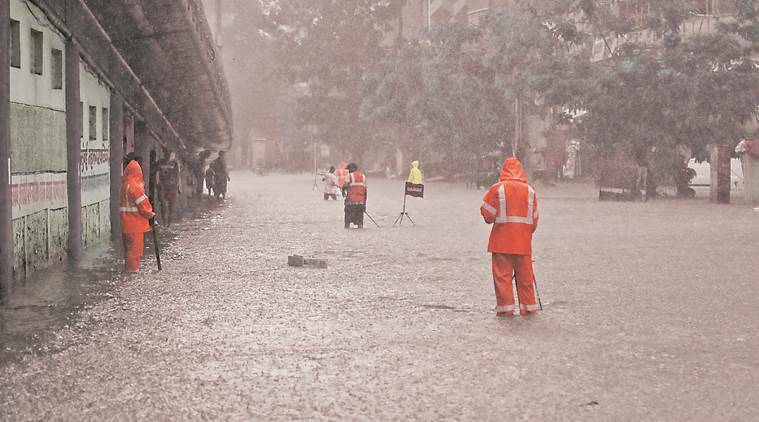 As heavy rainfall on Saturday marked the onset of monsoon for this year, waterlogging and traffic congestion reported in some parts of the city has raised serious doubts among citizens, activists and public representatives over Brihanmumbai Municipal Corporation’s (BMC’s) preparedness. Traffic congestion and severe waterlogging were reported on JVLR, Kings Circle, Dadar TT, Dadar’s Hindmata, Mahim and Parel TT areas that witnessed waterlogging due to sudden downpour. The civic body claimed it had identified 146 flooding spots in the city and on priority basis, it was working on controlling flooding at 55 of these spots before this monsoon. “This year, despite of complaining for several times neither BMC nor its contractors cleaned the filth that had been collected on the footpath of every road after desilting the nullahs. Now the rain have washed away this silt and garbage on the roads. Controlling waterlogging was another promise they had made, which flopped too,” said Advocate Vivekanand Gupta BJP Mumbai secretary and resident of Andheri east. Resident of Kings Circle and social activist Nikhil Desai on Saturday morning encountered a manhole cover that was getting dislodged due to water gushing out of the sewer manhole on the Babasaheb Ambedkar Road. “I immediately reported the matter to the disaster control unit. They initially didn’t even put a danger sign on the open manhole. However, only after pointing it out they put branches of tree into the drain to warn motorists. This was just a trailer. When it will actually start raining, it is going to be a disaster if it continues the way it was on Saturday,” Desai said. Desilting of nullahs are still to be completed at many places, claimed residents. While some nullahs were clogged, at many there were silt and filth dumped on both sides of the footpaths. When contacted, BMC chief Ajoy Mehta said work of nullah cleaning and work meant to restrict waterlogging were partly pending in a a few places. Opposition leader Dhananjay Munde held the Shiv Sena-led BMC and BJP responsible for the waterlogging in Mumbai. He even questioned Uddhav Thackeray’s earlier claim that the city was ready to handle monsoon this year. Saying that it was the citizens who came forward to help each other instead of the authorities, he claimed that Mumbai residents have lost faith in the BMC. Congress leader, Milind Deora tweeted, “This is pathetic. BMC is Asia’s richest civic body & yet we’re subjected to water-logging, malaria & potholes year after year. Poor planning, institutionalised corruption, bickering between ruling Shiv Sena-BJP & a disempowered Mayor are to blame #MumbaiRain”, from is Twitter handle,@Milinddeora. Like the BMC, the railways also defended itself asserting that despite the heavy downpour local trains weren’t brought to a grinding halt. The Central Railway (CR) had installed high capacity pumps at 19 locations to ensure faster removal of water. By installing these pumps, the CR had claimed that they would ensure minimal chances of waterlogging on railway tracks. However, within two hours of heavy showers, tracks at Sion, Kurla, Matunga and Sandhurst Road stations were seen submerged. “The effective working of pumps did not allow the water to rise. This is why, we could run trains all day long,” Sunil Udasi, chief spokesperson, CR said. “We were in continuous touch with the disaster management department and BMC to monitor rainfall forecast and train operations,” he added.